I'm 6'1. Would I realistically be able to BTL off a lob with a 40" running vert? Is 42" enough? I think that at my current relative strength levels, I am capable of jumping 40" after a few weeks of jumping practice. 42" is a realistic goal for next year. Wondering what kind of dunks I "should be able to do" with a 40" LRR dunks. Re: How high do you need to jump to BTL? I think it has more to do with timing and hand speed. From what ive seen i have enough vert to BTL but my shorter arms and lack of technique prevent me from doing so currently. When I was dunking 3-4x a week I was very close even off the dribble but never quite had the ball control necessary. That all said.... reverses, pump reverses if your quick, windmills and 360s should all be very close for you and achievable with practice. Yea I figure with great timing and speed it may be doable with a 40" running vert. Has to be perfect though I bet. I've done a reverse (harder than I thought), 180, a pump to my chest, two hand tomahawk. One time I almost landed a 360 back when i was a one foot jumper. I got up high enough but missed. Back then I weighed 170-175 and my squat:bw ratio was 2.05. It was the highest I was getting in my life. I had just switched from SL to DL RVJ about 5 months before that. I was still getting up almost as high SL. 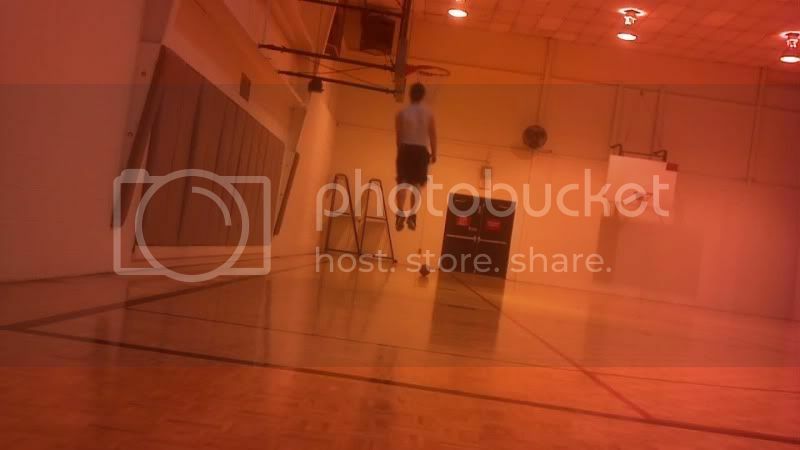 Since then I can't remember the last time I tried SL dunking lol. I also weigh 20-25lbs heavier, but my squat:bw ratio is ~2.2 now. I've trained with a lot of dunkers that can do BTL pretty easily... I trained with one that can jump 50'' but can do BTL very easily off a lob - he is jumping no more than 40'' when he does it... BUT he is a RL jumper which I think really changes it. There is a huge skill component to BTL - I doubt I could do it on an 8-foot hoop and I have the ability to get 36'' above the 8 foot rim which should make things easy... For a LRR jumper a reverse BTL might almost be easier... I don't think your vertical is going to limit you - but I don't think it will be easy if you haven't been practicing. Could even start practicing it left handed. it would take a ton of practice. i mean, even if you jump 45" you're only in the air for .92 seconds or something like that... gotta do that BTL movement quick! First time I've seen this vid. Nice dunks and I love the help you get from the kid at 0:16 in the video. That's at least as couple of inches right there. I love the help you get from the kid at 0:16 in the video.